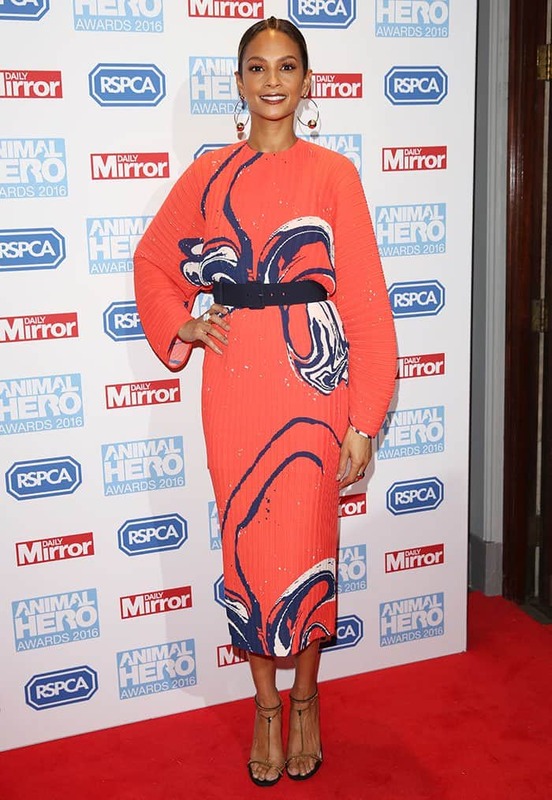 Alesha Dixon made sure all eyes were on her when she stepped out to attend the 2016 Animal Hero Awards in London on Wednesday. The 37-year-old singer was hard to ignore in a bright orange ‘70s-inspired ribbed dress. It featured wide, long sleeves, a concertina skirt, and psychedelic prints on the front. While it looked too big for her slender frame, the addition of the wide belt helped accentuate her tiny waist. Alesha accessorized the eye-catching look with gold jewelry, including a pair of large hoop earrings, a ring, and a bracelet. She styled her tresses into a neat up-do and wore gorgeous makeup with dark mascara and reddish-brown lipstick. To complete the look, Alesha put her pretty feet on display in a pair of Gucci “Ophelie” sandals. 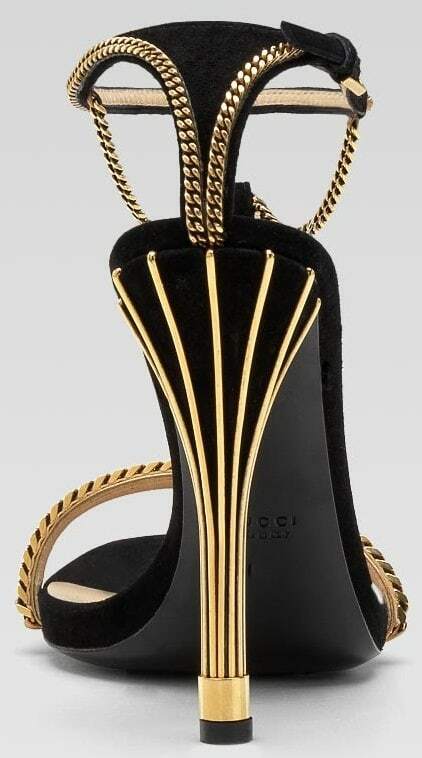 These sandals have metal chain straps, T-straps, and 4.5-inch cage-effect gold heels. I’m usually not into t-straps, but I could not help but fall in love with this oh-so-divine and delectable ‘Ophelie’ chain T-strap from Gucci’s Spring 2012 Collection. Isn’t this style gorgeous? Seriously, the thought of knowing that I can’t afford it sounds quite painful right now… Perhaps it’s time to put some coins in my shoe piggy bank. Now down to the facts. As you can see, the Ophelie, which features a tiny peep at the front, does not have a platform for support. Thing is, you actually need one with this number because the heel is a towering 5 inches high!